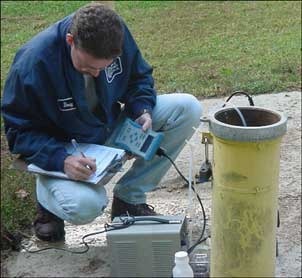 A technician takes a groundwater sample. Groundwater and surface water monitoring are crucial to measure how well the landfill liner system performs. Comprehensive sampling of 20 groundwater and 3 surface water points is performed quarterly and semi-annually, respectively. In addition, sampling and analysis of 8 neighboring property wells is performed quarterly. Results from this testing are compared to previous testing, to draw a conclusion of whether the landfill's liner system is performing as designed. These results are shared with the PADEP, London Grove Township and the adjacent property owners. To date, there have been no instances of contaminants observed at a monitoring point which was due to SECCRA's lined landfill. The PADEP also samples every well annually, to compare their results with ours.